It's again that magical time, when our community of readers gets to spend their well-earned CAPs and decide what is to be expected during another year of TAG. This time the stakes are on 1993, a year remembered fondly by all friends of good scifi TV shows, because then began the on-going search for paranormal events and alien life and government conspiracies trying to cover them up. Yes, I am talking about the truth that is out there. Before getting to games themselves, let's go through the rules. The administrators have had serious discussions on how to create the playlist and we've made a few changes from the previous year. 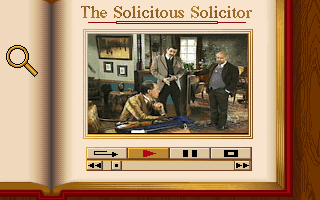 We have traditionally considered as Potential candidates for inclusion on the playlist all games that are either 1) listed on MobyGames as part of the adventure genre (excluding interactive fiction games) and have at least 10 votes or that 2) appear on the Wikipedia List of Graphic Adventure Games. This proved to be problematic, because the Wikipedia list referenced a Polish adventure game - and as far as we know, we don't have reviewers who would understand Polish. Since there's no sense in us reviewing games we cannot read, we've decided to modify the rules - now any Potential game must be made in English or in another language, which is sufficiently understood by some reviewer who is willing to play the game. We have also previously included as Potential candidates those adventure games, which belong in a series, later parts of which would be Potential games. This was a bit of a mouthful, so we've now decided simply to accept as Potential games all adventure games, which are parts of a notable game series. 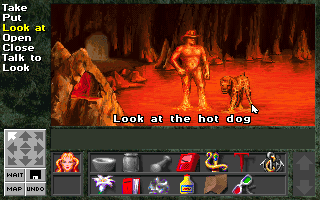 So, if Lord British ever decides to make Ultima XIV: Quest for Dry Socks as a point-and-click adventure, it has a chance to get on our playing list. Finally, since we are anxious to try all notable adventure games in existence, we've decided to include as Potential candidates also those adventure games which have been officially licensed from some other media. We are not going to accept all Tolkien fan games but only games with a real licensing contract, which in our eyes makes an adventure game notable enough. For instance, the TAG community now has many high-quality games from Capstone Software to choose from (ahhh, can we reverse this decision?). So much for finding all the Potential games. How to turn them into our playing list? Simple. A game will be automatically Accepted to the playing list, if it a) has at least 20 votes on Moby Games, b) appears on the Wikipedia List of Graphic Adventure Games and c) is clearly an adventure game (we might on occasion be lenient with this condition). Borderline game fulfills two of these criteria and Disregarded only one. Individual readers and groups of readers will then have the opportunity to use their CAPs to add Borderline and Disregarded games to the official playlist. Adding Borderline-games to the playlist costs 100 CAPs, while adding Disregarded-games costs 200. We used to have different rates for individual and group purchases of Borderline, but we decided to simplify this a bit, so that all game purchases cost in CAPs at least as much as blogging rewards for official games. The candidate list is now set in stone, so don't bother heading off to MobyGames to vote or to Wikipedia to edit the Adventure Games list. Any CAP trades need to occur before the introduction post for the last game of 1992 (Sherlock Holmes: Consulting Detective Volume II), after which time 1993's playlist will be set. Next year's games are to be played approximately in the chronological order wherever possible. The order can be seen in our AdventureGamer Spreadsheet. When dating the games, we have probably made many mistakes since our sources are quite unreliable, so if you know better, just speak up. All discussion on CAP trades for the 1993 playing list should be had on this post. The admins will be adjusting the CAP leaderboard and each game's status as trades are made. Will we have another intervention by Jim Walls? 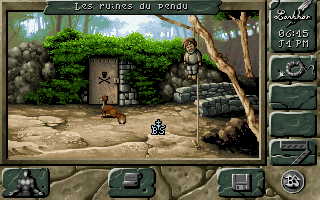 The best Sierra adventure game ever? Will it be as good as the first game? Did they have one mushroom too many? Is it the best Kyrandia game? What happened to Passionate Patti? Will it be as memorable as the Infocom text adventures? Is it clearly a graphic adventure game? Does it have 20 or more Moby Games ratings? Is it on the Wikipedia Notable Games list? Was this the ultimate year of classic adventuring? Who put this piece of trash in the Wikipedia list? Sonic the Hedgehog + King's Quest = ? "I am baking a birthday cake to Kayla's birthday party!" Benjamin Franklin in a bubble bath? Will they finally meet Moriarty? Doom + King's Quest = ? You probably thought we had forgotten this. Last year, we introduced Panthro's Law - administrators have the right to introduce an arbitrary number of non-Potential games as candidates for the playing list. We've decided that a maximum number of games that administrators can introduce will be determined by the last digit of the game year. Thus, we now have a chance to introduce three new games. Adding these games to the official playing list will cost 500 CAPs. Remember Mortville Manor and Maupiti Island? Lankhor, the company behind these rather original detective adventures produced yet another adventure game, Black Sect. Like its predecessors, it is supposed to be a cruel game with time sensitive events, a complex interface and a small, but devoted fan base. And Black Sect has been bought to playing list by Ilmari (-500 CAPs). 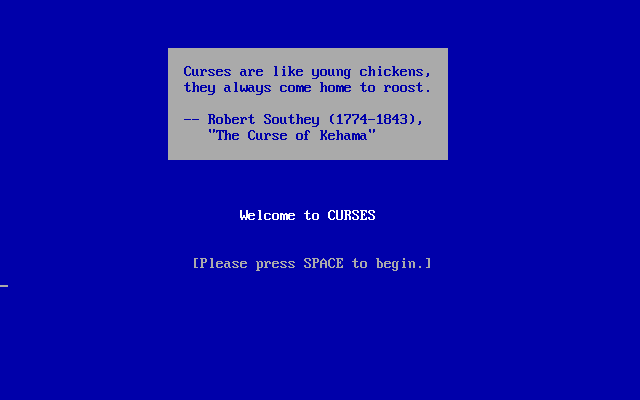 We've usually avoided plain text adventures in our main playing list, but Curses just might prove to be the first exception. Graham Nelson's game is a classic, which began the era of modern non-commercial interactive fiction. It is not just historically important, but even today a fun game to play. And Curses has been bought to the playing list! (377 CAPs coming from Voltgloss, 100 from Reiko and 23 from Rowan Lipkovits). It is somewhat surprising that Kronolog isn't on the Wikipedia list of adventure games (at least when we consider what other "classics" the list contains). It is definitely not a gold standard game, because the interface is clunky and there are some game crashing bugs. 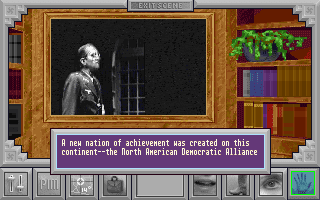 Still, it is an interesting tale of a dystopian alternative world, where Nazis won the WW2 (or Soviet Union won the Cold War, if you are playing the German version, Red Hell). And Kronolog has been bought to playing list by Ilmari (-500 CAPs). Just like in previous years, we will also decide who's to play what game in the comments below. Especially with continuing series, reviewers for previous parts are preferred over completely new reviewers. As a completely new feature, commenters may use 25 CAPs to suggest a suitable reviewer for a certain game. Bear in mind that 1) the reviewer has no obligation to accept the suggestion and 2) administrators have a right to veto suggestions, if they seem to be concentrated on few persons. 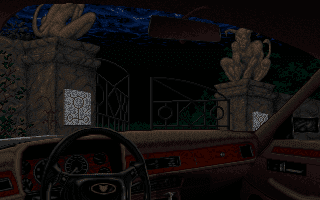 Gabriel Knight 1, Day of the Tentacle, Quest for Glory 4... I expect our top 10 to be heavily transformed. BTW, The Adventures of Melvin Freebush Wikipedia article is a redlink (doesn't exist), so I dunno if it really satisfies that criteria. Apparently it isn't notable enough to have an article. I'll have a Pepper's Adventures in Time (100 CAPs), please. Well, the rules speak about the Wikipedia list, not about it having an article... We'll probably tighten the rules for the next year, not to get more instances like this. Presumably Mobygames will have a bigger role in determining the candidate games. One Peppered Adventure coming right up! Wow there's a lot of games this year. Some great ones! Also some... perhaps not quite so great ones. So, are you willing to put up some CAPs for either of the games (or both of them)? Some extra HTML-code had sneaked its way down there. I think it should be fixed now. Some great games coming up, but nothing on the lower lists induce me to want to spend any hard-earned CAPs to add them. I think the accepted list speaks for itself. Yes, the list is pretty impressive this time. I wanted to add Veil of darkness but it was immediatly added, well, I dont know how many points I have, but I want to spend if I have enough, to add Isle of dead, I played that game last year and I want a full review of that thing. Well, you have 204 CAPs and Isle of Dead would cost 200 CAPs... So, it's a deal! What a year! I think 1993 was the full speed of my adventure game addiction as I've played almost a lot of these games back in the day. I'll use 100 of my precious CAPs to buy Ween : the Prophecy of which I have fond memories, and I volunteer myself to play through it as well. As per reviewing duties, I'd love to play through Lost in Time too, as it's almost the same game interface as Ween, and you can count me in for Myst, 7th Guest, and globally any Myst-like the world will encounter as I love this kind of games. 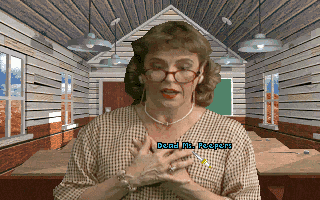 I'd love to play through Gabriel Knight as it's probably my favorite game of all time, but I'm pretty sure a more "seasoned" reviewer would be more suitable for our readers for a game of this stature. This should start memories for many people -- many, like myself, were adamantly against that style of game, and some thought that they shouldn't even be considered adventures at the time, even though an argument could be made that it's really how a text-adventure would be viewed with graphics. Alfred: By your command! Ween's now on the playing list and you've got yourself a lot of new games to play. Let's see if there are any other volunteers for Gabriel Knight, before saying you won't play it. Michael: Will have to remember it in, say, 14 years, when we get to games of 2000. And Alfred: I guess you won't mind playing the second Kyrandia after going through the first one? If I recall correctly, 7th Guest isn't so much a Myst clone as it is a loosely strung together series of standalone puzzles much like the Dr. Brain games (less educational though). I haven't played it or the sequel myself, one day. Alfred: Good luck on Lost in Time. I played it back in the day (still own a box copy) and got bogged down on underclued and illogical puzzles. Very interested to see a full playthrough. 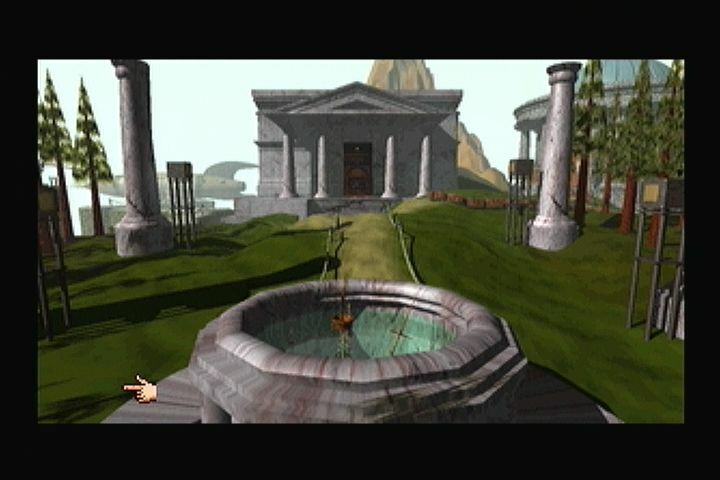 Zenic, I can see 7th Guest comparisons with both Myst and Dr. Brain. Wandering around a place solving logic puzzles seems to be the basic gameplay premise of all three. Dr. Brain didn't put the effort into the setting, atmosphere and backstory that the other two did though. I'm a fan of the 7th guest games - no doubt partly because I'm a sucker for a haunted house story. I'm even a kickstarter backer for the semi-official fan made third game which will come out soon? according to their updates. Ilmari : I'd love to play the second Kyrandia game, it's been a long while and I have very fond memories of it! I'm a bit worried about the third one though... it stumped me to no end back in the day and I think I never made it through the second area... but it's a problem for 2021 when we'll reach it! Reiko : You worry me... I remembered this game as pretty easy but considering I have very few precise memories of it, I'm not sure if I ever completed it... we'll see! Alright, Kyrandia goes to Alfred and 7th Guest changes its reviewer to TBD. My impressions of 7th Guest might be misplaced, maybe it does have more of a connected world/story. Thanks Alfred. I'm actually really excited to see how Myst ends up - its reputation is that of a real love-it or hate-it game. Oh boy. I am like a kid in a candy store, but I have to be VERY frugal with what I play if I'm going to get to the end of the Infocom marathon in time for Return to Zork. 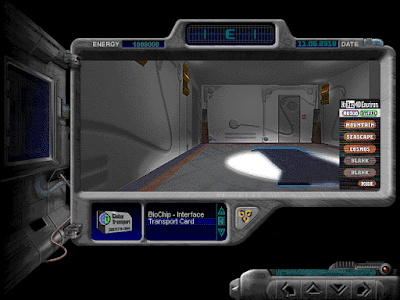 I'd really like to play Journeyman Project II in 1995 as it was one of my favorite games in high school, although all I remember is a cute AI you could talk to. So I may need to slide that into my column to be able to play the sequel. I'll buy to move Beverley Hillbillies to the play column, but I hope someone else will play it. If no one does, I will because it is "famously" bad and I like licensed games. But I have to be frugal. Also include me as a potential reviewer for Xanth. I was OBSESSED with Xanth around the time this came out, but I couldn't afford the game and heard that it was a poor adaptation. I'd love to play it if I can squeeze it in. 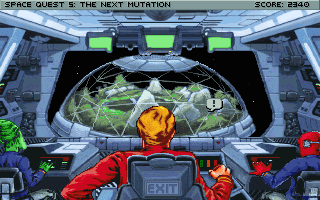 And yes, I'd like to do the Star Trek and Space Quest sequels since I did the previous in both series. Alright, Beverly Hillbillies is now officially to be played - and just to make your life easier, I can volunteer to play it (I know I'll probably regret this). Just to be clear: do you want to buy also Sherlock Holmes, Dracula and Journeyman Project (all of which are still borderline)? I am sure you will have first choice for the reviewership of ICOM games, but I seem to remember that Reiko was interested of playing Journeyman Project. Xanth added to your potential playing list. Yes. Please add all three, but if Reiko wants to do Journeyman Project then I will be pleased to step aside. OK, Reiko gets Journeyman Project. ...So, what can I do to scrounge together the additional 23 CAPs needed to get my total up to 500, solely so I can blow them all at once and add Curses! to the list? I would say I'd go halfies with you there, but I'm a few short for that milestone. Certainly you can spend 23 of my never-spent points to get Curses on the list, though! Alright, so 477 points from Voltgloss and 23 from Rowan. Done! Curses! is to be played! Yes, lots of exciting games coming up! Some of the horror games look interesting so I'll look into those and probably volunteer there. But on first glance I'll put my name in the hat for Sam & Max, Simon the Sorcerer and maybe Gabriel Knight. I say maybe for Gabriel Knight because like Alfred, I'm a big fan. But there's one puzzle I'd LOVE to read about someone who's never played before solving. I solved it with a walkthrough but it'd be cool to hear the solving process from someone who didn't cheat - so if any of our reviewers hasn't played it, I might be the first to request a specific reviewer. I notice nobody's chosen Day of the Tentacle. For myself, I know that game so well the puzzle solving would almost be automatic and I don't want to take the 'best game' opportunity away from someone else. Is this a case of the prettiest girl in school never getting asked to dance? I'll also throw Eric the Unready, Call of Cthulhu and Return of the Phantom into the list of games I'd like to play. Ok TBD I see what you mean. I didn't remember that puzzle before you mentioned it but now I do. I did solve it with a walkthrough as well back in the day and I agree with you : it would be great to have someone with no previous experience of the game to review it. 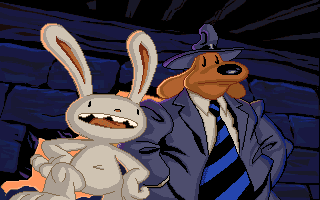 OK TBD, your name is now on Sam & Max and Simon the Sorcerer. And on Eric the Unready, Call of Cthulhu and Return of the Phantom. 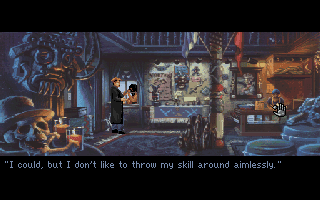 I have never played Gabriel Knight, but I'm also 90% sure I know what puzzle you're talking about (and am spoiled on its solution). I suspect I may not be the only one in that category. It's been a while, but with Simon the Sorcerer, Return Zork, Myst, and Quest For Glory 4 on the list of up coming games, I'll have to check back in more regularly. I've never played Day of the Tentacle (and I'm not sure I actually beat Maniac Mansion if that's required) or Gabriel Knight (although I've heard of an infamous puzzle in the third game(?) with making a disguise). If you don't have any other reviewers, then I could do those two. DOTT stands up on it's won, even though some of the characters reference their times in Maniac Mansion, you don't need to know anything from that game to solve any puzzles in DOTT. Part of the reason -- in Maniac, you chose which 3 players you used for the mission. 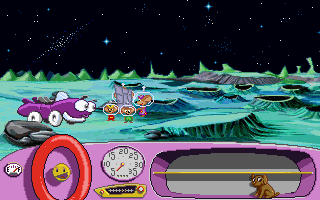 In DOTT, the 3 are chosen for you, and only one of them was from the original. And he didn't really have a personality in Maniac yet. Agree with Michael. I played DOTT years before Maniac Mansion (I tried the version of MM that came with DOTT but didn't bother getting very far) and never felt I was missing anything important. Nice to hear from you, Zenic! 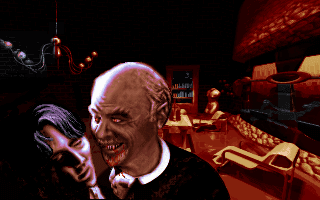 If there's no one else who hasn't played DOTT or Gabriel Knight, it would be great, if you could do them. Damn! I was hoping to be fast enough to ask for Shadow of the Comet. I remember playing it ages ago and, as a Lovecraft and CoC fan (not of Lovecraft's questionable social views by the way), I think I liked it - apart from the mandatory labyrinth. Oh well, I guess I can settle with the CAPs for playing along, whenever that would be. Hm, I haven't played Gabriel Knight (and I own a copy through Humble Bundle or something like that). Hi limbeck. It's not necessarily a first come first served basis, so seeing as you haven't done a review yet and want Shadow of the Comet, I'll happily step aside. OK, there seems to be a consensus that Zenic should make a glorious return to the blog by playing DOTT, so I've put him down for it. With Gabriel Knight, there's couple of eager first timers (at least Zenic and Reiko), so I'll leave that empty for a while. 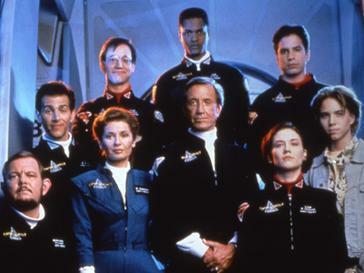 And Shadow of the Comet goes to limbeck. I have a few other games already, so I'm fine with Zenic doing Gabriel Knight. Looks like we have a double Zenic feature for 1993, then! Reiko, if you want to play around the same time I think it'd be good to compare the original with the remake (Steam release). 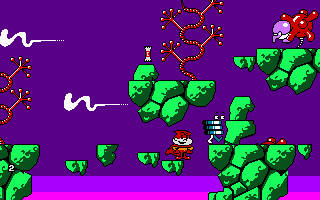 Apparently they reworked some of the puzzles and added new ones in addition to touching up the graphics and music. According to the schedule it's one of the last games in the year, so we have time. Okay, that's a cool idea. So you'd be playing the original and I'd play along with the Steam version and make some comments comparing them? I'll have to see which version is the one I already have. 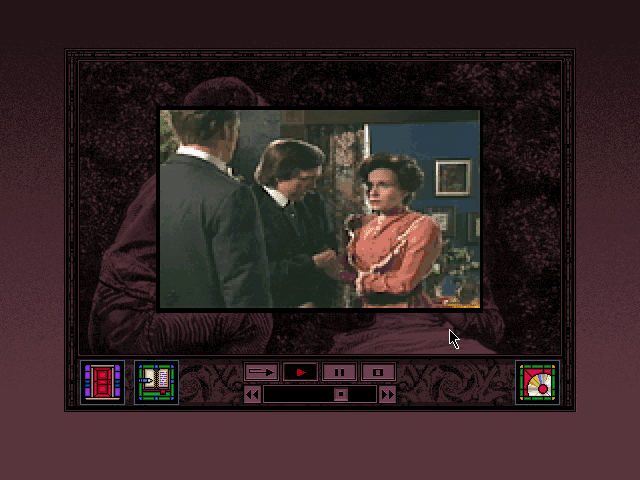 Oh dear Lord, another Police Quest, another Larry, AND another Jim Walls game? This year is going to kill me. 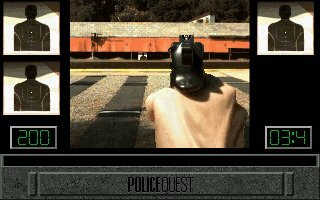 Can I have a good game like Freddy Pharkas or QfG IV as a palate cleanser if no one else claims them? At least someone else suffers through Beverly Hillbillies . . . by the makers of LA LAW! Alex: I think you'll deserve both Freddy Pharkas and QFG IV after your glorious take on L.A. Law - and for your continuing dedication to games by Jim Walls - so, let's put our name on there! Not fair, Alex. You make it seem more torturous than it really is. The new Police Quest game was a disappointment to me -- because Jim Walls wasn't involved. Other people loved it with a passion. That said, I'm sure some research on the life and times of Daryl Gates will be interesting context for that review. Especially with today's political climate here in the states. Blue Force -- also a disappointment to me, but only because I was eagerly awaiting the next installment of Sonny Bonds kills a member of the Bains family. But also, not a complete waste of gaming, just not what 15-year-old me was expecting. OK, one of the Panthro's Law games is already on the playing list, so let's put the other two there also: 1000 CAPs away from me! Since I did the previous Lankhor game, I'll volunteer to play the Black Sect. Also, I'll use the new opportunity to suggest reviewers for the other two Panthro's Law games - 50 CAPs away from my cash. Firstly, I'd really want to see what TBD with his refined B-movie sensibilities will say about a scifi romp of Nazis taking over the future. So, I suggest TBD as a player for the Kronolog: Nazi Paradox. Secondly, I'd really like to see what Joe, after playing through the whole of Infocom catalogue, will think about a more modern piece of IF, which in a sense carried on the torch of Infocom. Thus, I suggest him as the reviewer of Curses! (provided it is played at the end of 1993, after Joe has had enough time to complete his marathon). Now, these are only suggestions and both of my colleagues have the opportunity to reject them, but I am interested to see whether they'll accept the challenge. 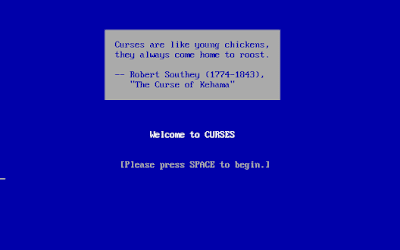 I'll be happy to pick up Curses, especially if I can do it at the end of the year. Great! Let's reserve these games for you. Curses is hard. I tried to play it once and didn't get far. I'll be very interested to see what our indomitable solver of Hitchhiker's Guide will make of it. I would like to reimburse Voltgloss for 100 CAPs to show my support for Curses being played. And Voltgloss gets 100 CAPs back, when Reiko gives 100 of her own for Curses. 1993 seems to be a great year, with a lot of games I've actually played. I had Shadow of the Comet but never got further than the first couple of minutes, as I recall. I'll be interested to see that. I'll put your name on the game. And you are quite correct, this would be the first finished Magnetic Scrolls game. We had a would-be-reviewer starting Wonderland and never completing it. The games of the company would be a great material for a new marathon. I'll also buy Putt-Putt and American Tail for the list. The former because I think the story of Humongous entertainment is an important one for this blog and the history of LucasArts. The latter because there are no cats in America and the streets are paved with cheese. I'm not volunteering to play either, although I would play American Tail if no one else wants to. I shouldn't tell you this, but I probably the only person who has never played Day of the Tentacle. Or rather, I played five minutes of it in German one time and I didn't speak enough German to understand it. I've played DotT, but only just recently (some time in the past couple of years; the remastered version on Steam I expect). 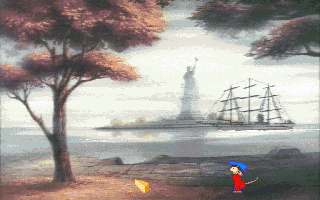 I never played the Monkey Island games at the time, either. Putt-Putt and American Tail on the list! I'll be doing the first Putt-Putt, so I guess I'll be doing the second one also. Interested of taking any particular game? Zenic expressed an interest to DOTT, but only if no one else wanted to do it. Frankly I was excited to see the prospect of Zenic's return playing DOTT and Gabriel Knight, so I'm expressly keeping my hat out of those particular rings. As to other games not yet assigned... I'm reading more about Isle of the Dead, and as far as I can tell, it's a Wolfenstein/Doom/Quake knockoff with adventure game pretensions. Overwhelmingly negative reviews. Makes at least one "worst games of all time" list. ...Hell with it. I played plenty of terrible Quake mods back in the day. How much worse can this be? Only one way to find out. Sign me up. Pepper's Adventures was supposed to start a new time travel edutainment series, but I don't know if there were any more. I could cover it if you all like, but I don't think there's any connection to Ecoquest. Also, just confirming that I'm happy to cover Ecoquest 2 and Gateway II, the two that already have my name on them. Voltgloss: Congratulations, this piece of tr... terrific originality is yours to play! Reiko: I think someone expressed an interest for Pepper's Adventures at a comment bit more down, so if you are not that keen to play it, let's give it to the other person. You'll definitely get Ecoquest 2 and Gateway 2. We haven't even reached my second game of '92 (Nippon safes inc.), but what the hey! I'll volunteer for a game. Not sure which, though, since most of the good (or at least high profile) ones are taken. I could go for Gabriel Knight, but I have played it before, so you maybe you'd like to give it to someone new? DOTT I know like the back of my hand, so that game should also probably go to someone with less of an established relationship with it. Currently all the Panthro's Law games and all Disregarded games have become accepted. And there's still a lot of time for all the remaining Borderline to be boosted,so I am sure you'll have a lot to choose from. 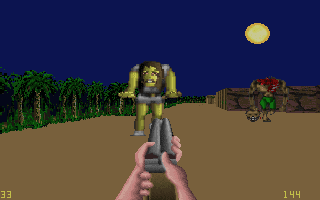 (Isle of the Dead is also free, but that is a first person game). Pepper's Adventure is probably the best of the lot. Technically I should be doing Gobliins 2, since I've signed up for the first game, but I can be very easily persuaded to give it to someone else. Same applies to the Beverly Hillbillies game, if some poor soul really wants to do it. I could give Fievel or Wayne a go, if nobody else wants to..? There definitely hasn't been any takers on Fievel or Wayne, so you can definitely have either of them. Even both, if you really want. I think Will was a bit more enthusiastic about playing Bloodnet, so maybe reserve it for him? Since no one else is picking it up, and it looks interesting, I'd like to cover Veil of Darkness. The developer has quite the history with RPGs, it seems to have light RPG elements, and produced by SSI. Also, it'd be good to take on a post here before tackling two of the biggest games this year. Put me down for Wayne, then. And maybe tentatively for Fievel, if nobody else wants it...? OK, Zenic gets Veil of Darkness and Torch gets both Wayne's World and Fievel. Did they add in some more plot to the second game? I thought the Goblins games were just set-piece puzzles (somewhat similar to, I dunno, Lemmings). I think Gobliins-series has a bit more plot than Lemmings - I am not sure, since I've tried to avoid any info about the games, since I am going to play them. 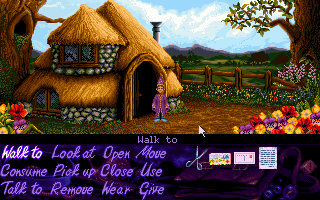 In any case, we've been rather lenient on what counts as an adventure game. I‘d love to do BloodNET if there are no other takers - always wanted to play it. And Pepper‘s Adventures in Time, as I own it but have no clue what it‘s about. Time travel, possibly? Alright, I'll put you tentatively as a reviewer of Bloodnet (unless Torch wants to really take it). I'll also sign you up for Pepper's Adventure (Reiko was suggested for it, but she didn't seem that enthusiastic about it). It's definitely about time travel, but it's also an educational piece, so you might learn something about history. I like time travel (I did Timequest), but if you already own it, go for it. It sounds like it's a well-done children's game, so maybe too easy but still fun? It's definitely a fun game, and as for its difficulty, I'd say it's similar to EcoQuest. Inspired by Rowan's plea, I'm going to buy Dare to Dream and Cosmic Spacehead on the list. -200 CAPs for me. That means there are only three candidate games not on the list: Inca II, Fatty Bear's Birthday Surprise and The Adventure of Melvin Freebush. I'll throw 100 CAPs at Inca II. Ilmari's name is already on it to review, so it'd be a shame to pass that up. I do have a thing for Humungous Games, so I'll pony up to throw Fatty Bear on the pile if no one else does. I expect those games to be quite short. I‘m glad you did, Joe, as I think that the Humongous Games deserve a place on this blog. Inca II is now on the playing list, and yes, since I'll be reviewing the first game, I'll have to take the second one also. And Fatty Bear is also on the playing list. Indeed, a seasoned player would probably finish it in little under half an hour. Well, Michael's hopes were shattered in couple of hours. The lack of Melvin Freebush in the list is the last sign of common sense here (although I am tempted to buy and review the game, just to see how horrendous it can be...). Huh, because Ilmari's name was on it already, I didn't realize it hadn't actually been bought for the list. I would have offered at least 50 CAPs toward it. Alright, Reiko, I'll split the costs of Inca II between you and Zenic.